Keith Heseltine and David Wix are a couple of careful young lads. We first meet them out in the summer dusk on the edge of Haw Bank searching the high field, for what? Badgers, perhaps. Or a ground spring bubbling its way to the surface. They can hear vibrations, a drum, there's a strange light, and in an extraordinary and eerie sequence, out of a crack in the earth steps a smiling drummer boy. Actually, I was quite spooked. Our drummer boy, Nellie Jack John, apparently stepped into an underground passage up at the town castle two hundred years ago looking for King Arthur's rumoured treasure, and got a little lost somewhere along the way. He hangs around for a day or two rather forlornly looking for his own people before he finally has to admit to himself that he is wildly astray and needs a little help to find his way home. Keith and David are able to oblige and see Nellie Jack John off back down the crack in the earth. But that is not the last they see of him. And, more important, the little candle-end which he leaves behind acts as a kind of door wedge in time. All manner of evil things start to drift around on the open moor. Things which are normally best left sleeping the long sleep along with King Arthur and his knights, waiting for their time to come. We glimpse marauding giants who think nothing of rustling two hundred pigs at a time - there's our connection with the wandering standing stones - and a brilliant boggart (see my article 'Boggart' in the Ideas section of this site). A tense read. 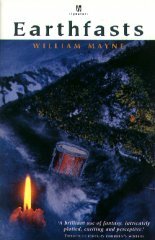 I love the way William Mayne writes, dense and powerful, but his style is demanding of the reader, and I do find I have to read his books quite slowly. I find parts of the dialogue challenging because it is written in dialect, some of it ancient dialect, but you can be sure that if it is important William Mayne will translate it for you. The light was the light of an electric torch. It was the lamp from David's bicycle, and it was held by Nellie Jack John, who was walking at a snail's pace towards them. In relation to him they were racing by. Nellie Jack John looked as if he were working hard, and as if he were going very fast too. His hair, which was long below his cap, was streaming out behind him, and his clothes were pressed hard against him, and he was leaning forward. But the air round him was still. Well, obviously he's never going to get back to his own time if you keep thwarting his every attempt. But watch this theme, because there's more of it in Cradlefasts, the next book in the trilogy!